ARINC 429 Verification IP implements the air transport industry’s standards for the transfer of digital data between avionics systems. ARINC 429 Verification IP provides an smart way to verify the ARINC 429 standard data transmission and control interfaces between source and sink. The SmartDV's ARINC 429 Verification IP is fully compliant with ARINC SPECIFICATION 429 PART 1-17 and provides the following features. Supports ARINC SPECIFICATION 429 PART 1-17. Supports all word structures and protocol necessary to establish bus communication as per the specs. Supports simplex, twisted shielded pair data bus standard Mark 33 Digital Information Transfer System bus. Supports LRU with multiple transmitters and receivers communicating on different buses. Supports Transmission rates at either a low speed 12.5 kHz or a high speed 100kHz. Low speed operation 12.5 kHz, with an actual allowable range of 12 to 14.5 kHz. High speed operation is 100 kHz. Supports bipolar and Return-to-Zero encoding format. Supports duplex or two-way communication in Maintenance Data and Acknowledgement between source and sink. 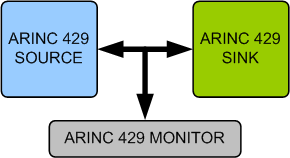 ARINC 429 Verification IP comes with complete test suite to verify each and every feature of ARINC 429 specification. Faster testbench development and more complete verification of ARINC 429 designs. SmartDV's ARINC 429 Verification env contains following. Complete regression suite containing all the ARINC 429 testcases.